Laudetur Iesus Christus! We have some very important 1st-Class Feast Days coming up. These announcements are also listed in the St. Ann’s Bulletin, so many are already aware of these. Firstly however, I wanted to direct everyone’s attention to a great article on St. Ann’s Catholic Church that ran in the latest edition of Regina Magazine. St. Ann’s was featured in the Amazing Parishes series that has been running in the magazine (Click Here). The article was written by local St. Ann parishioner, Zach Levering. Great job Zach! Sunday May 22nd: Holy Trinity Sunday, 12:30pm (1st Class Feast): On the traditional Liturgical Calendar, Trinity Sunday marks the official end of the Easter Season and the beginning of the Season after Pentecost. 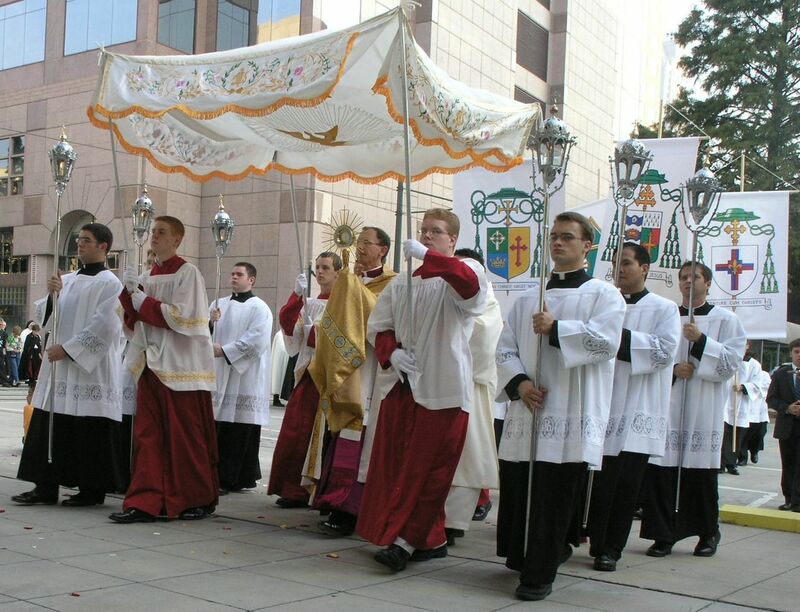 Thursday May 26th: Feast of Corpus Christi, St. Ann’s 7:00pm (1st Class Feast): All around the world in Catholic countries, this Feast is a Holy Day of Obligation and in many places it is a national holiday where all businesses are closed and they have huge processions through the streets. The United States is one of the few countries to downplay this Feast by transferring the obligation to the following Sunday. What a great blessing that our Bishop and Pastor have such strong devotions to the Holy Eucharist. 40-Hours Devotion (or Quarant’Ore) for Corpus Christi: St. Ann’s will be hosting a 40-Hours devotion immediately following the Corpus Christi Mass on Thursday night. There are sign up boards in the Narthex of St. Ann’s for people to sign up for one hour time blocks. Please sign up!!! The 40-Hours Devotion, introduced into Rome by St. Philip Neri in 1548, is the collective adoration of the exposed Eucharist for a period of 40-hours, in honor of the time Our Lord spent in the tomb (no single person is expected to spend 40-hours in adoration) [Excerpt from Fish Eaters]. Feast of the Sacred Heart, Friday, June 3rd, St. Ann’s 7:00am (1st Class Feast): The Feast of the Sacred Heart falls 19 days after the Feast of Pentecost. While it always falls on a Friday, this year we have the extra grace of it falling on a First Friday of the Month, which is tied to the First Friday Devotion to the Sacred Heart.There is an ancient tradition, whereby Catholics prepare for this Feast by beginning a Novena to the Sacred Heart on the Feast of Corpus Christi (Thursday May 26th) which is the Thursday of the week before. On the Feast of the Sacred Heart itself, we can gain a plenary indulgence by making an Act of Reparation to the Sacred Heart. Friday June 3rd is also a great day to enthrone our homes to the Sacred Heart of Jesus. More information can be found on this page. Calling all members of the Confraternity of St. Peter: The Confraternity of St. Peter is a sodality of lay faithful who wish to unite themselves to the Priestly Fraternity of St. Peter (FSSP). Rightly so, the FSSP leadership will not share out names, leaving it up to us to find each other, but we have been told that on aggregate, there are 62 members of the Confraternity in the greater metro-Charlotte area. A few of us who have already found each other, are talking about putting together some organized local events such as talk and reflections. If you are currently a member (one of these 62 members) of the Confraternity, and would like to be involved in some local events, please send us an email via our webform and tell us your name. If you are not a member currently but would like to join the Confraternity of St. Peter, please see the “How to Join” link on this page, and then also send me an email via our webform so we know who you are.